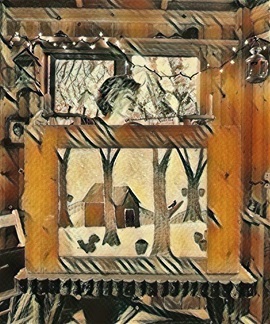 Sue Truman in the cabin. Original photo by Doug Plummer. Then digitized! Welcome! I am a fiddler, guitarist, stepdancer and crankie artist living in Seattle. A crankie is an old storytelling art form. It's a long illustrated scroll that is wound onto two spools. The spools are loaded into a box which has a viewing screen. The scroll is hand-cranked while the story is told, a song is sung or a tune is played. If you haven't seen one before, then a video is worth a thousand words. You will find hours of viewing on this site. The term crankie is being used now to name this very old art form. 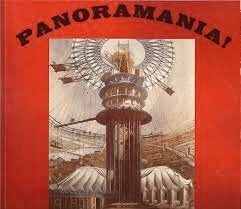 In the 19th Century, they were called moving panoramas (among many other names). This scrolling, picture art form is experiencing a bit of a comeback and I am excited to be a part of it. This website attempts to connect the old (moving panoramas of the 19th Century) with the new (crankies being made today by artists in the US and beyond). To watch new crankies: click on the WATCH A CRANKIE page. In that section you will find crankies made by artists from the US and abroad. To watch moving panoramas that were made in the 19th Century, click on the HISTORY section. There are videos of LARGE and SMALL moving panoramas that have been filmed by museums, historical societies and private collectors. Heartfelt thanks and gratitude to those individuals working to restore and preserve this forgotten piece of our history. I hope you enjoy exploring this site, AND I encourage you to MAKE A CRANKIE! Created Sept. 3rd, 2012. Find The Crankie Factory on FACEBOOK and You Tube. I am posting a lot on Instagram under the clever name of SueTruman1015. REVISED WEBPAGE: MOVING PANORAMAS OF THE MISSISSIPPI -In the 19th century, there were seven different moving panoramas of the Mississippi River. This webpage looks at three of them plus one 21st century EPIC recreation. Finally, we will look at a pocket-sized, hand-cranked ribbon map of the Mississippi River. This glorious moving panorama poster is from the 1870s. It is advertising a Hibernicon show. Image from the Library of Congress. THE HISTORY SECTION Twenty five pages of 19th century moving panorama information. Thank you to Erkki Hutamo, Russell Potter, Suzanne Wray, Jeffrey Ruggles, Peter Morelli, Sara Velas, Michelle Grandshaw, Nick Whitmer and all who have graciously shared their research with me. Check out the new webpage HIBERNICONS: A Moving Panoramic Tour of Ireland. 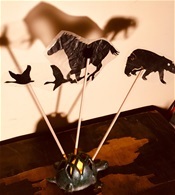 NEW WEBPAGE - Make a shadow puppet. Shadow puppetry can be a nice addition to the crankie, especially if it contains action scenes. Singing, piano and artwork by Julie Vallimont. Song composed by Joe Raposo. 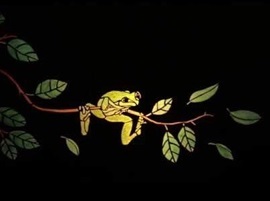 WATCH A CRANKIE - Over 100 videos of crankies from artists around the world. Big crankies, miniature crankies, crow crankies and more. Thank you Cranksters for sharing your wonderful crankies!! Ha, ha. This is my copy. Coffee stained, highlighted, dog-eared = well-used! Illusions in Motion: Media Archaeology of the Moving Panorama and Related Spectacles is the book by Professor Erkki Huhtamo. If you are interested in learning about the history of moving panoramas THIS IS IT! NEW WEBPAGE! 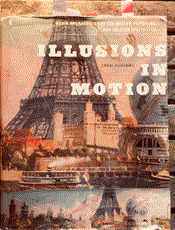 See Erkki's collection of 19th century toy and souvenir moving panoramas. 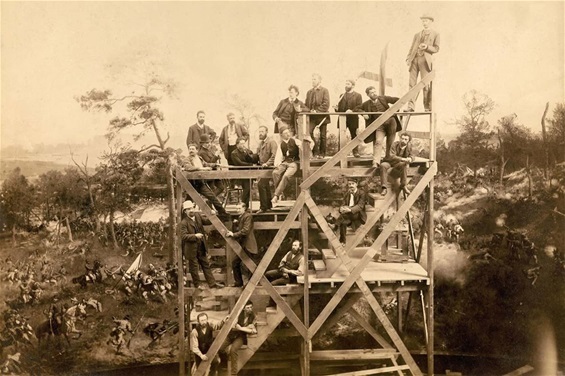 The Atlanta Cyclorama was painted by Milwaukee artists in the 1880s. The artists are on a scaffold because the painting is 49 feet tall! Whoa. THE INTERNATIONAL PANORAMA COUNCIL - The 28th annual conference will be held Sept. 26-27, 2019. Honored that I will be one of the presenters! My talk with be about Hibernicons. Find out more here. The conference will be at the Atlanta History Center, at the new Atlanta Cyclorama. 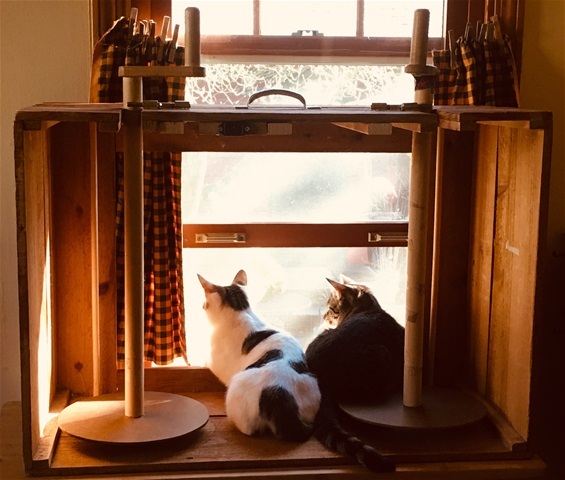 March 28, 2019 - Meet the new members of the family - Spot and Buddy. We have had them for two weeks and they have stolen our hearts!